U.S. Wind Inc. and Skipjack Offshore Energy LLC must construct ALL Three Phases and any future Offshore Wind Turbines off the coast of Fenwick Island, DE and Ocean City, MD no closer than 26 nautical miles from the shoreline [or at least 26 nautical miles or more from the shoreline]. Demand that the Maryland Public Service Commission and the Bureau of Ocean Energy Management construct all of the wind turbines being built at least 26 nautical miles from the shoreline in Maryland and Delaware. The Mayor of Ocean City, the Ocean City County Council, and most of us are in favor of green energy. However, when initiating a green project some common sense needs to be in place. The currently proposed turbines are 8 mega watt units, they are 370' tall from the water line to the hub with a 550' blade diameter. The overall height from the waterline to the tip of the blade is therefore approximately 650'. The height of the Washington Monument. When a change of this magnitude is encountered, it is not unreasonable to expect the distance from shore would increase to ensure that the turbines will not be seen from the shore. 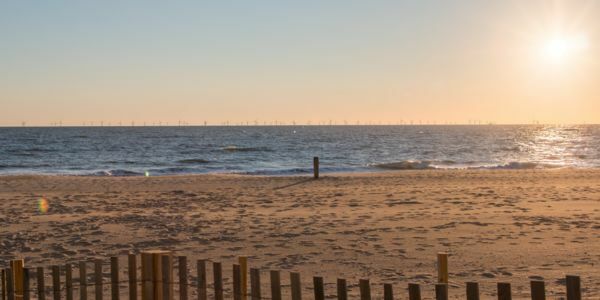 The current proposed field off the Maryland coast consists of 86 turbines constructed in 3 phases and extends the entire length of Ocean City, from the inlet to the Delaware line. Phase 1 is located 17 miles offshore, phase 2 is 15 miles offshore and phase 3 is 13 miles offshore. There are no limits to the number of turbines that can be constructed in a given lease area. The quantity is more constrained by the spacing required between the turbines so that the turbulence caused by one turbine does not affect the adjacent turbines. Essentially, the larger the turbine, the greater the spacing and therefore the fewer the turbines. There are many businesses that depend on the ocean view and there are many people who value the unadulterated, untainted view of the horizon, of the sunrises that the ocean shoreline bestows. The ocean has been there long before we walked this earth. It is one of the few untouched views that are left in this world. It would be a grave mistake to take that pure, unsullied view away for the sake of 20 years of "clean" energy. We should fight to keep our visual environment CLEAN as well. We can have the wind turbines and the view with a mere ten mile east movement of the turbines. The current field off Delaware supported by the Maryland subsidy consists of 15 turbines. The siting map is nautical and does not show street names. The location starts just north of the Town of Fenwick and runs to the indian river bridge. It is located approximately 19 miles from Ocean City. There are plans to construct 50-60 additional turbines in the northern portion of the Delaware lease area but these would not be subsidized by Maryland utility customers. We the taxpayers are subsidizing the turbines that will cause the destruction of a view that is unparalleled and now it is time to stand up and demand that we, the people, are heard! We do not want to see the wind turbines. U.S.Wind and Skipjack make your millions, but put the turbines OUT of our sight. They can be green and also NOT seen!